If a picture is worth a thousand words, then Pinterest is the biggest dictionary. As of recent, Pinterest hit 10 million U.S. monthly unique visitors faster than any independent site in history. An increase of 2,702.2%! It has experienced exponential growth since bursting on the social media scene in 2011 and had the largest year-over-year increase in social desktop usage, social web usage and social app usage. And how do users spend time on Pinterest? They spend most of their time pinning pictures on their boards, 83.9%, followed by liking other pins (15.5%). The engagement on Pinterest is not that strong, only 0.6% of users comment on pins. 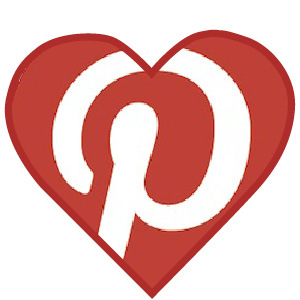 Moreover, 80% of the content shared on Pinterest are re-pins of pictures from other users. In terms of gender, females still dominate Pinterest’s usage, making up the overwhelming majority of the audience – more than 80%. It has been proven that more women than men spend money online. A large portion of women even buy all their clothes on the Internet. In fact, Pinterest pins with prices get 36% more likes than those without. If you’re looking for interaction and traffic, then Pinterest is not such a bad option to pursue. The site has a strong community and is steaming with activity. You can easily strike up a following if you’re active. This infographic will give you some detail on how users are interacting with pins, boards, other users and brands on Pinterest in order to grow your following on this social networking site. As a side note, over 1/5 of Facebook-connected users are on Pinterest daily, which represents more than 2 million members. (source: AppData) If you have a Pinterest business page, you can add a Pinterest app to your Facebook business page for free. Check out Woobox, the #1 provider of page apps for Facebook. It’s a free tool and the process is simple to connect the two accounts. Also, if you do have a Pinterest business page, feel free to leave your page URL in the comments section. I’ll be sure to check out all the pages. Virtual networking is another great way to build your followers and increase the awareness of your brand. Nielsen has just released their 2012 State of Social Media Report report. The report highlights lots of interesting details about the top social networks and where we’re using social media. The report tips a 37 percent increase in the total time spent on social media in the U.S., reaching 121 billion minutes in July, compared to 88 billion in summer 2011. One in three social media users prefer contacting a company via social media vs. calling them by phone. A term now known as ‘social care’ –customer service via social media. The ultimate social network, Facebook, remains the most-visited in the U.S., and earned the title of most popular Web brand in the U.S. this year. It reached 152.2 million PC visitors, 78.4 million app users, and 74.3 million mobile Web surfers. That dwarfs social sites in all categories (see graphic below), beating No. 2 Blogger by more than 93.7 million PC users. In the mobile app race, Facebook, Twitter, Foursquare, Google+, and Pinterest carry the top five spots. Top networks like Facebook and Twitter have profound staying power in a world where social media options are expanding every day, including breakout star Pinterest, which boasted what Nielsen reported is the largest year-over-year increase — 1,698 percent. It’s now bigger than Google+ and closing in on LinkedIn, which remained static this year. These numbers have made it clear that Pinterest can officially be considered part of the “big four” social networks. With so many mobile options, it appears nearly a third of people ages 18 to 24 write Facebook comments, send tweets, and perhaps even blog from the comfort of their bathroom. Those ages 25 to 34 are more likely to use social networking in the office. For all of the celebrity accounts and political usage accrued by social media, it seems that people still focus on connecting with friends and family members. More than 60 percent of people turn on Facebook to keep up with someone they know in real life, while 9 percent initiate LinkedIn contact because of a person’s physical attractiveness, Nielsen reported. It comes as no surprise, but Nielsen has found that people are spending more and more time on the internet. The main reason for this is the increasing amount of smartphone owners, tablets, handheld music players like the iPod touch, game consoles, Internet-enabled TVs and e-readers with access to the internet 24/7. The overall unique audience using mobile apps increased 85%–7 times more than on the mobile web. PC usage dropped 4%. On top of this, the number of minutes spent on mobile apps increased 120% from 2011. These numbers are huge. But consider this: social media use accounts for 20% of a user’s time on PCs and 30% on mobile devices. Considering these are both such large chunks of consumers’ internet time and the fact that this internet time is skyrocketing as it is, time on social media is exploding. Want to know where your consumers are? Social media. Want to know where you should be examining your marketing strategy? Social media. Remember what life was like before social media? It’s hard for me to remember. If you want to see the full report, go ahead and download Nielsen’s 2012 Social Media Report for yourself. If you found this article helpful, be sure to follow me on Twitter, “Like” me on Facebook, follow me on Pinterest, and follow BrandLove, LLC on LinkedIn. I post many more tips and tricks on my other social channels. Thanks for reading my post and I appreciate your support! Pinterest Rolls Out Business Pages. Pintastic News! On November 14, 2012, Pinterest rolled out business pages in an effort to help more businesses provide great content on Pinterest and make it easy to pin from their websites. There are two ways that you can get your Pinterest business page up and running. 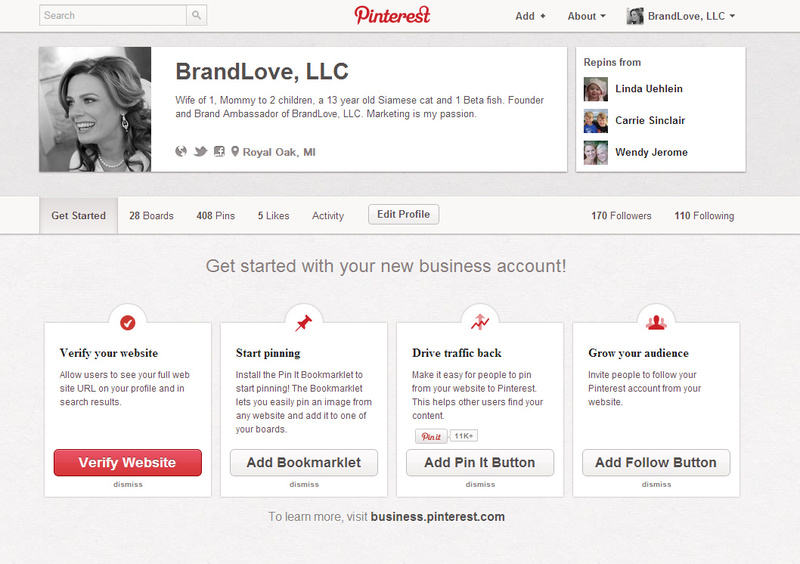 First, if your organization is new to Pinterest, sign up for a business account. Second, you can convert your existing personal account by following the steps on the business site. 1. New Business Terms. Basically, there are now two sets of terms—one for people and one for businesses. The business terms help guide businesses on how to use Pinterest. They are half as long, the language is simplified and they are offering “translations” of the legalese language. 2. Add new buttons and widgets. Integrate the Pin It button, Follow button, Profile widget, or Board widget to get more engagement from pinners and traffic back your site. Check out new guides and documentation for the Pin It and Follow buttons and how to use the Pinterest brand in marketing materials. 3. Verify your website. After you’ve signed up on Pinterest or converted your account, you’ll need to verify your website. The verification badge helps people identify high-quality sources of content and more easily find the business they want in search results. 4. Access to upcoming features. The Pinterest blog was very vague about what these upcoming features are going to be so there’s not much insight that I can give you. Maybe some metrics? Now that you have (or will soon have) an official business page on Pinterest, I recommend using pingraphy for scheduling and tracking pins. Also note that Pinterest has published some case studies from the following companies: Jetsetter, Allrecipes, Etsy, Organized Interiors, and Petplan Insurance. These companies share metrics and describe how they successfully used Pinterest to increase customer reach, drive traffic to their sites, and engage their strongest advocates. You might want to check them out! Not surprisingly, the top 9 networks are Pinterest, YouTube, Google+, Instagram, Tumblr, Facebook, Twitter, LinkedIn and Foursquare. Depending on your business, you might not take advantage of all, but use at least a few. The research for this infographic was conducted by the SDL Social Media Team and it was created by SDL SM2 and Bizango Business Websites. It provides helpful tips on each of the above mentioned social platforms to help you get a very basic understanding. Great for beginners, but not enough detail for the advanced social media manager. If your brand still isn’t using Pinterest, then it’s time to step in and take advantage of its enormous popularity – by now, it’s certain that Pinterest isn’t a fad, so don’t wait anymore. Since Pinterest has been made primarily for the B2C market, running contests in one of the most effective strategies on Pinterest: it is easy, can be inexpensive and it will help you engage with your audience in the ways that will increase referral traffic to your website and generate buzz about your brand. Really, any business that relies on driving a high-volume of website traffic to increase sales, should consider joining Pinterest. Research indicates that Pinterest is more effective at driving traffic to websites than any other social platform, even Facebook. Pinterest is the third most popular social network in the U.S. in terms of traffic. 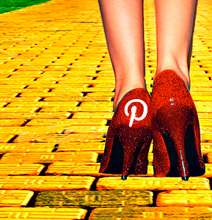 Pinterest has accumulated 14.9 million users as of July 2012. Pinterest is retaining and engaging users as much as 2-3 times more efficiently than Twitter was at a similar time in its history. Over 80% of pins are repins, demonstrating the tremendous “virality” at work in the Pinterest community. Pinterest accounted for 3.6% of referral traffic as of January 2012. Shoppers referred by Pinterest are 10% more likely to make a purchase than visitors who arrive from other social networks, including Facebook and Twitter. 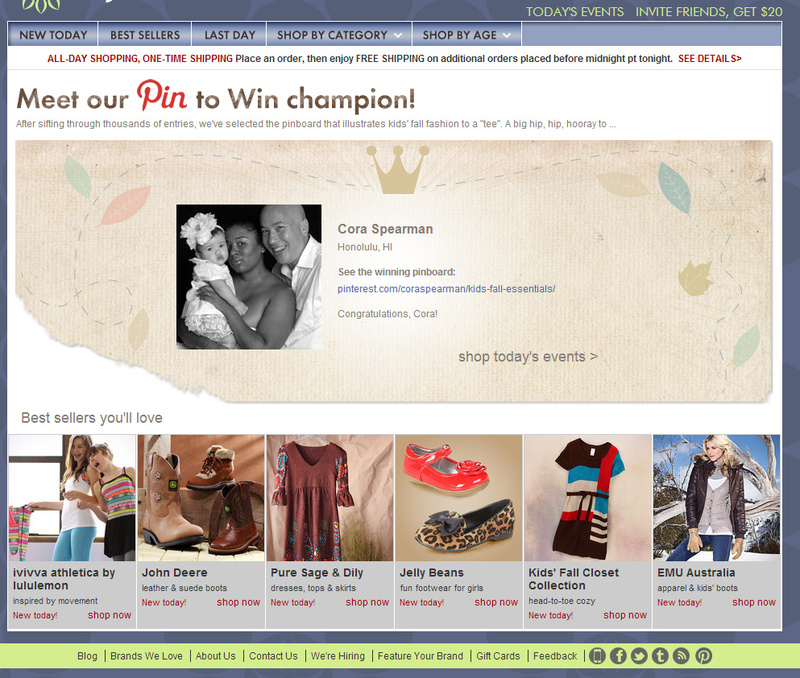 Zulily’s “Pin to Win” contest got customers to create a board on Pinterest and pin items for their kids’ fall wardrobe from the Zulily website. 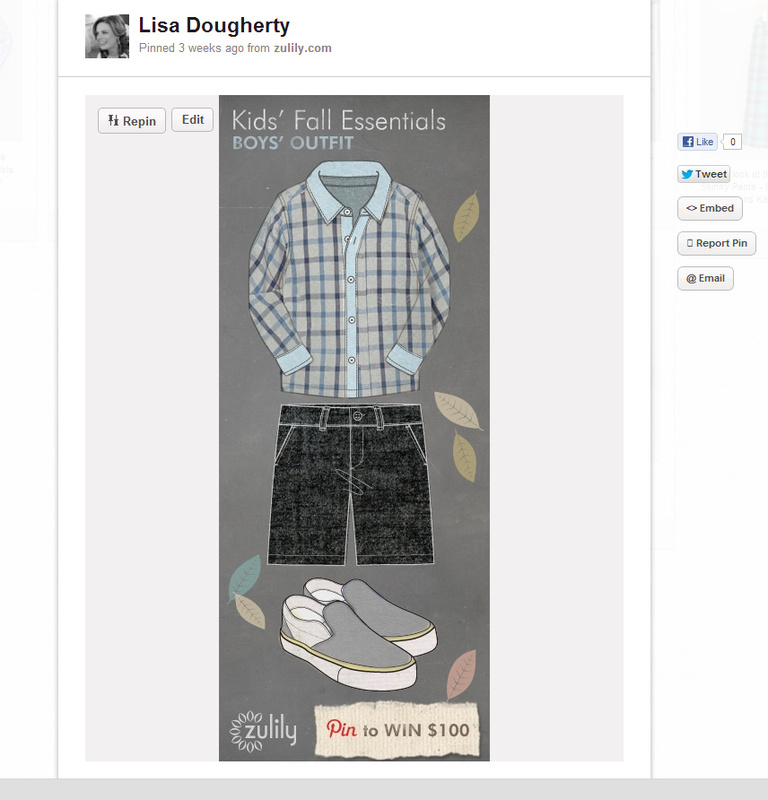 They even incorporated Twitter into the marketing mix by adding the hashtags #zulily and #fall in each caption. Here’s the gist of the contest. In this type of contest, entrants create pinboards/pins based on contest rules. Users like/repin or vote on the entries, and as the name suggests, eh entry with the most votes wins. Take a look at how Victoria Secret ran this contest. World-famous brand of women’s wear Victoria’s Secret is making great use of Pinterest contests. After successfully running their Dreaming of a PINK Summer Pinterest contest and receiving thousands of entries, Victoria’s Secret launchedanother alluring Pinterest challenge: My Victoria’s Secret Summer, from July 6, 2012 to August 20, 2012. To participate in the contest, users have to go to the contest details page at Victoria’s Secret Facebook page. Participants then pin at least three images from the Victoria’s Secret fan page or website and create a pinboard. The six best pinboards are selected, and the one that receives most votes wins the grand prize. Victoria’s Secret has also created a detailed set of terms and conditions for the contest, which is a great thing in order to protect the company in case of any disputes. The best thing is, Victoria’s Secret is not only promoting their products, but also is increasing traffic to their Facebook fan page and website through the contest. This is an excellent strategy to maximize the returns on your contest, while also making the contest more interesting for participants. Pin the entry image from Victoria’s Secret Facebook page, at least three images from VictoriasSecret.com, and summer-inspired pics to your pinboard. Once done, submit email-id and the board’s URL on Victoria’s Secret Facebook page. A panel of judges, including Victoria’s Secret model Candice Swanepoel, will select six finalists from all eligible entries. The finalist entries will be displayed on the Victoria’s Secret Facebook page and visitors will vote for the grand-prize winner. Prize: One grand-prize winner will receive a $1,000 Victoria’s Secret gift card. Five first-prize winners will each receive a $200 Victoria’s Secret gift card. Review Pinterest’s terms and conditions before creating your contest. Set goals and objectives you want to achieve with your Pinterest campaign. Create a contest with your target audience and goals in mind. Choose a prize that will excite and engage your audience. Have clear and simple participation rules. Create an attractive landing page, clearly describing your contest, including terms and conditions. Encourage social sharing of the contest. Utilize your existing audience to promote the contest, blast out the contest to your email lists, blog, Facebook/Twitter or other social media presence. Make sure that images are repinnable and linked to the correct landing pages. Utilize pin descriptions to include clear copy. This will help you reach a wider audience—beyond the first repin. If your business has had success in crafting contests for Pinterest, please share your successes and “lessons learned” with us!